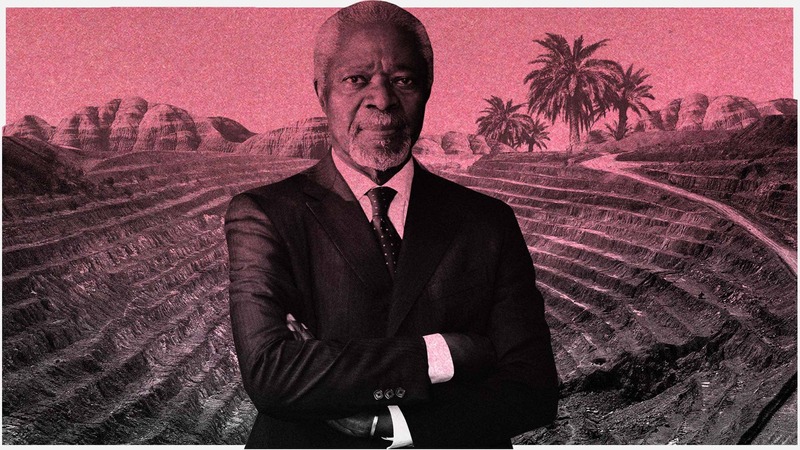 Mr. Annan, why is Africa so poor? Africa isn’t poor. It’s a rich continent with many, many poor people. Around $160 billion dollars flow into Africa each year – inflow through transfers made by Africans living outside the continent and in the form of aid assistance. But we lose over $200 billion in the outflow. So, in the end, we are a net transferor of resources out of Africa to the rest of the world. In your 2013 Africa Progress Report, you shed light on the fact that around $1.36 billion was lost by the Democratic Republic of Congo between 2010 and 2012 in the form of mining rights for copper and cobalt that were sold to firms based on the British Virgin Islands at prices far below their actual value. That would have been enough money to cover Congo’s health and education budgets for two years. How is something like that even possible? The problem begins with the contracts governments sign with the multinationals. Some countries are so keen to attract multinationals that they offer indefensible concessions to try and attract them. These companies also exploit that. They will tell you, for example: We need to get our investments back before we begin sharing the profits. Sometimes, as part of the concession, they’re not even required to pay taxes for many years, which is really wrong. In Congo, we have the classic example of the country’s elites, foreign firms and investors colluding to jointly loot the country. Who is primarily to blame for this? It takes two to tango. The African officials who are signing away their country’s resources at an almost giveaway rate in the expectation that they will get something are really betraying their people and the trust they have put in them. This has a real and direct impact. It takes development and food away from people. The multinationals and the investors also have to know that they have a certain responsibility and obligation. They don’t need a government law or necessarily a strong government in place for them to do what is right – legally, professionally and morally. Sometimes, they even go to the extent of telling you: If we don’t pay the bribe, the competitor will pay it – and take the business away from us. This is something I don’t accept. The only way to stop this sort of game is to push for transparency. Transparency is a powerful tool. We should get the companies and the governments to publish the contracts that have been signed, what the companies earned and how much they paid to the government in taxes. The public also needs to know what the government did with the money. Offshore companies in the Caribbean or elsewhere, of the kind that are often operated by these companies, are frequently used to conceal things. Do you think they should be banned? Some would tell you there’s nothing wrong with tax havens and shell companies – and that, sometimes, there are legitimate reasons for using them. But we cannot forget that these instruments can also be used by criminal elements or what I call uncivil society, to do incredible things. It would be wonderful if we had an international regime that revealed who is behind these shell companies and who the beneficiary owner is. There have already been many initiatives to push for increased transparency, but most have yielded very modest results. That is true, but here I must say I was encouraged by developments in Europe when the way in which companies like Apple, Starbucks and others are paying only minimal taxes became clear. The citizens got really angry about it, and the politicians realized something must be done. Still, in many instances, tax avoidance schemes remain legal even today. The companies simply exploit loopholes that have been left for them by politicians. … which makes it easier for them to loot. Yes, it makes it easier for them to loot, but only for a while. Because at some point, either the country collapses or the system becomes so chaotic that – if you’re a serious and honest company – you don’t want to operate there. You’ll be competing with the adventurists who don’t care about their reputation. And the country naturally also pays a price. So, business leaders have to set a good example. Do these business leaders listen to you? In your 2013 report, you named international commodities trader Glencore as a player that profits from the weakness of the Zambian state. Did the heads of Glencore ever answer you? Yes. They read our report and were not particularly happy. They called the director of the Africa Progress Panel and indirectly threatened to sue. I think it was more intimidation tactics, because if they were to sue, they would have to answer lots of questions themselves. They would have to prove that what has been published by us and others is completely untrue. The other thing I tried to do, which didn’t really come to pass, was to try and see if we could get the major mining companies to come together. Here, I am talking about reputable companies like Anglo American, BHP Billiton and Rio Tinto. The idea was for them to sign a code of conduct for their operations in these developing countries. I had several meetings, but we couldn’t bring the process to successful closure. Bringing a group like that together with their own corporate interests is not always easy. I have no power or authority to go and tell them they should approach it in certain terms. I gave them an example of what I did with AIDS, for example, when I invited the chairmen of the seven largest pharmaceutical companies to meet with me in Amsterdam, to plead with them to reduce the cost of medications so that the poor could afford them. It was difficult at the beginning but, in the end, the prices came down quite low. Today, millions are on medication. If the will is there, then we can do something. But voluntary commitments can be reversed at any time. What is needed are binding political and legal frameworks. In recent years, you often referred to the G-8 and G-20 countries as potent levers for instituting a multilateral approach on tax evasion and avoidance. But the topic wasn’t high on the agenda at the G-20 summit this summer in Hamburg. Does the international community simply lack the will to tackle this issue? Quite a lot of the big companies operating around the world come from G-8 or G-20 countries. That’s why these countries have a special responsibility to ensure that their companies operating in the poorer countries also show some responsibility and are not just exploitative. Even if they don’t have a global agreement for this, they can begin to look at things at a national level. If people were not paying bribes, there would be no takers. Yes, and that’s why the banks also need to be asking: “What is the source of this money?” With new technology, we should be able to trace all this money. And when it is traced, it should be sent back to the country it was stolen from. One argument that you often hear in this context is competition. Companies always look for the country that offers the lowest tax rate, and the governments argue that if they raise taxes, the companies would simply go elsewhere. Are politicians justified in their concerns? Let’s take one region, Europe: You have a membership of 28 countries. And these companies are allowed to play one country off against the other. When Brussels woke up to this problem – whether the issue is moving the company to Luxembourg or to Ireland – and started making moves, some of these multinational companies decided themselves that they had to pay more. By using transparency, suddenly everyone wakes up, the companies and the countries. And often with pressure from the people, with people saying: “This isn’t fair. We pay our way. How come this company making millions or billions in profits is paying so little or nothing at all?” I think the competition argument is overdone. You served for 10 years as the secretary-general of the United Nations. Why can’t the UN tackle these problems? It’s possible to impose sanctions on supporters of terrorism and on countries that proliferate weapons of mass destruction. Why can’t the UN also impose sanctions on those who evade taxes and promote corruption? Only the Security Council can pass an enforceable resolution, and we also see with other issues how countries get around enforcement and implementation of these resolutions. For the UN to take action, the member governments have to not only agree, but also go home and implement it. I don’t see it as a practical option. The individual countries need to assume their responsibility and ensure that companies are held accountable. There are also some interesting initiatives on the international level: The Organization for Economic Cooperation and Development, for example, has begun training African tax collectors and customs officials. The program is called Tax Inspectors Without Borders and it is modelled after Doctors Without Borders. I hope they will push it as far as possible. You made a name for yourself as a mediator in many of the world’s wars and crises. Is it more difficult to tackle issues where big money is involved than civil wars? With war and peace, either it’s a civil war or one or two or several countries at war. You can usually get the other countries or actors to come together because they are not directly affected and they can all rally to stop a war. But when it comes to the sort of issue we are talking about, there are so many vested interests that you will not get the traction to get it done. Your son Kojo was involved in a corruption scandal surrounding the Oil-for-Food program in Iraq. Last year, the Panama Papers also showed that he had been a shareholder and director of several companies in the British Virgin Islands and Samoa. Where do you stand on this? If something is wrong, it’s wrong for everybody. You don’t excuse relatives or sons. He used a shell company to buy an apartment, which was really unnecessary. I don’t see why one should go that route. It’s not something I would advise or condone. Can you imagine a day when development aid will no longer be necessary for Africa because revenues from the country’s wealth of natural resources will flow into the continent’s development? I look forward to that day. I think most Africans would want to be able to rely on trade to lift themselves out of poverty rather than live on handouts. Africa has great potential – and a young population. Researchers refer to a demographic dividend, but it can also be a demographic curse, unless we tackle the issues you’ve raised. We need to create economic development in these countries and we need to create conditions in which young people can make a decent living at home, without giving them any incentive to move elsewhere to greener pastures.